These have certainly been trying times for our Phillies, who are fresh on the heels of a four-game sweep by the Los Angeles Dodgers, softened by a bushel of injuries, and seemingly ripe for the picking to the rest of the suddenly youthful (and dare I say, talented) National League East. We will start with Bullhorn Kid. Has the Phillies performance of late been acceptable in light of the team's many injuries, or do you feel as if they're underperforming? ARE YOU #$@#ING KIDDING ME? ARE YOU $#@!#ING KIDDING ME WITH THAT QUESTION? THAT'S AS BAD AS THE $! *#@#*$@ PILE OF MONKEY *#(@!$@# I'VE BEEN WATCHING OUT ON THE FIELD EVERY $@#*(@$ NIGHT. GO #$@!$ DIE IN A THREE-ALARM FIRE. THIS TEAM IS $*!#! !$ RIGHT NOW, AND THOSE TWO CRIPPLES BEING CRIPPLED AREN'T $@#!$ WHY. OH AND %&@~ CHAD QUALLS AND HIS $#@%8I FACE JUST NEEDED TO GET THAT OUT THERE STUPID WHITE BAEZ. To you, Good Job, Good Effort Kid. I think the Phillies are trying really hard and we should support them. OH GO %&$% YOURSELF, BIRD CAGE, IF THEY WERE TRYING JUAN PIERRE WOULD BE A FOOT TALLER AND ABLE TO CATCH A FLY BALL AT THE WALL AND WOULDN'T BUNT IN BATTING $@#$@ PRACTICE AND OH YEAH ^%&* JOHN MAYBERRY TOO THAT GUY IS DEAD TO ME SHIP HIS #$% BACK TO CRAPVILLE TOMORROW AND TAKE THE F#$%^*(*G BUS FARE OUT OF MY ALLOWANCE I'LL SELL MORE PAPERS AND MOW MORE LAWNS BECAUSE UNLIKE GREG $#&@ING GROSS I EARN MY MONEY! Here, here, settle down Bullhorn. That was a quick and witty-albeit longwinded- retort. Good job! OH MY GOD WHAT IS $%^&*()%$ WRONG WITH YOU? Nothing is wrong with me, and frankly I don't see why feel the need to resort to ad hominem. I merely support my team come heck or high water, haha. What's so wrong with that? You know, athletes are just genetically superior humans. They need encouragment and support just like everyone else. Goodness. While I understand your point of view I still think that perhaps the Phillies are really just not a very talented baseball team. They are what their record says they are. Nonetheless, you should still be there rooting them on. Maybe your general manager will acquire some talent at the trade deadline? Hey- where are you going? I'M LEAVING BEFORE I END UP SMACKING YOU IN YOUR SIMPLETON HEAD. BESIDES, I NEED TO GET HOME AND FINISH MY MATH HOMEWORK. I DON'T WANT TO END UP AT SOME PANSY @#$ LIBERAL ARTS COMMUNITY COLLEGE LIKE YOU. F*&K YOU, F#%& CHARLIE MANUEL, F%&* RUBEN AMARO, F$%& ZOO WITH ROY, F#$%^ TY WIGGINTON, F*(^% CHAD QUALLS, F&*$ DOWNTOWN HOST, F@#$ KYLE KENDRICK, F#$% JIM THOME GUY IS A $@*#($ ZOMBIE, F(*& SHANE VICTORINO AND HIS RITALIN FACE, F%## Y AND F$%^ EVERYONE. Can we please stop fighting?! 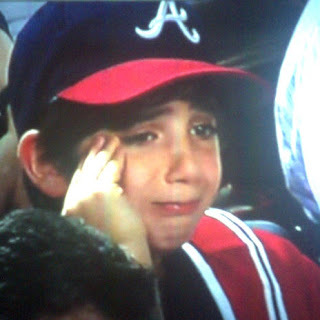 It's okay, sad Braves kid. Also, congratulations on being so in touch with your emotions. I'm proud of you. Good job, Bullhorn! Good effort! It's been great debating with you. OH.MY.GOD. GET AWAY FROM ME YOU FREAKY CREEP. Well, that went much better than I had anticipated, actually. I think we've all learned something about ourselves, each other, and the nature of fandom. "Oafy mantis." That's simply perfect. And a phrase that's never been typed on the Internet before, to boot. I think the Phillies could use a closed-door meeting with Bullhorn Kid in charge. Great interview! Next you need to track down hex boy. We could REALLY use him.